Sony has introduced the DSC-G3 with a browser: This Wi-Fi enabled camera includes a browser, which Sony assures us makes it easy to gain access to hotspots. 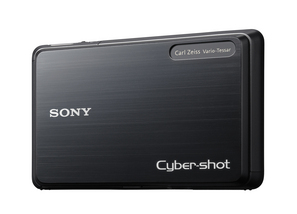 The camera includes access until 31-Jan-2012 to a special upload site via AT&T’s hotspot network, the Sony Easy Upload Home Page. Because if there’s two things that digital photographers want, it’s another photograph/video upload interface to learn and configure, and the ability to type in user names and passwords into a tiny tiny tiny Web browser. Goodness knows, I’ve been waiting for that. Sony joins the other Wi-Fi enabled camera makers in creating a problem where a solution exists: multiple companies (Boingo and Devicescape leap foremost to mind) have figured out how to uniquely identify devices and enable no-entry logins at hotspots through an external account. But Sony gave us a browser. Hurrah. The camera has 4 GB of built-in memory, and uses the increasingly less-standard Memory Stick format for additional storage. The 10-megapixel, 4x optical zoom camera with Carl Zeiss Vario-Tessar lens has a 3.5-inch touchscreen LCD, and is available today for $500.